11,500 Songs in Total, Yes 11,500! FREE DISCO LIGHTING with every Jukebox: DJ / Karaoke Machine. All in one DIY DJ & Karaoke Machine Jukebox. Contains over 6000 DJ songs, covering 1950′s to todays top 40 hits. Contains over 5500 Karaoke songs, more than any other karaoke machine hire supplier. Great sounding 2 x 15 inch speakers, making this system a bigger clearer sound than our competitors. Most old style jukeboxes only contain 1 x 12 inch speaker. Karaoke words appear on the monitor. Just as you would see in your local karaoke venue. Easy to use DJ and Karaoke software with easy to use search functions. No more discs! DJ software that has automatic mixing, YES, automatic mixing. You choose all the songs you want played and the software will do the rest for you. No gaps in between songs. This keeps everyone dancing! We deliver, setup and pick up. Set up against a wall or set it up like a stage so singers face your guests. The same DJ and Karaoke equipment as our professional DJ and Karaoke hosts use but this is presented as an easy to use do it yourself set up. Every DJ and Karaoke Machine comes with an easy to use instruction booklet . 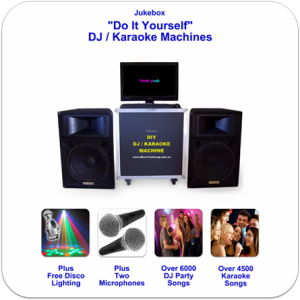 Hire our jukebox: DIY DJ and karaoke machine for a few hours or overnight for the same price. * Subject to availability, does not include peak season or new year’s eve. Prices are subject to change at anytime without notice. * Black Tie Group reserves the right to cancel your booking without notice if upon arrival at the specified address they find your venue / setup area unsuitable, unsafe or unsecured. The Black Tie Group were very helpful and flexible with our booking requirements and very easy to deal with. Their understanding of our needs for our staff/client Christmas Party made it a very smooth process. We had an absolute brilliant night with your karaoke jukebox. It was so easy to use and your song collection is massive and covered all of our favourite bands. People were up singing for the entire party. Everyone kept asking us where did we hire the machine from and we handed out heaps of your cards. We’ll be using your services again in the not too distant future and so will our friends. Great night, great machine, great staff, thank you for making our night a huge success. Awesome company, amazing service. The machine was a huge hit, everyone loved it and commented on how easy it was to use. Awesome selection of songs and highly recommend this service to anyone and will be using you again. Thanks so much. We hired the Karaoke machine again for a second year in a row for a soccer break up. It was once again a fabulous night and the service and help of all at Black Tie Group was superb. I would recommend them for any function. Thanks once again to all at Black Tie Group. I hired it for my 13th birthday and everybody loved it! All of my friends were saying it was the best party they had been to. They were never disappointed when all of the songs they wanted to sing were in the karaoke list and they thought singing with a microphone was soooo cool! And when we did the presents and the cake we just had my favourite songs playing. When my friends walked in they were like ‘WOAH’ when they saw the disco light flashing every where! All-in-all, I have to agree with my friends that the karaoke jukebox made it the best party ever!!! Thank you again for one of the most entertaining nights in a long time. Your music selection kept our guests happy all night. Making our reception a night not to forget!